On October 1, 1917, the 142nd was organized as a regular infantry and trained at Bowie Camp near Fort Worth as part of the 36th Division. Transferred to France for action, the first unit of the division arrived in France on May 31, 1918, and last August 12, 1918. The 36th Division moved to the Western Front on October 6, 1918. Although US forces were late in entering the war that had raged since 1914, their participation provided the margin of victory as the war played out its bitter end. In two days, the 36th Division was engaged in a major battle. Attacking the Germans in the trenches, the Americans were not protected across a vast expanse of land, with the exception of the heavy artillery fire that covered the 142nd Infantry. The artillery fire kept the Germans pinned, allowing the Americans to kill and / or capture the Germans in their own trenches. 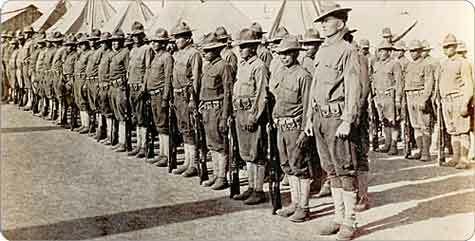 It is widely reported that at least 1,000 Native Americans from Texas and Oklahoma served in the 36th Division of the American Expeditionary Forces, or 600 from the same states but only within the 142nd Infantry during the First World War. The irony with these numbers is that it is impossible to go back to the source and find the first mention of these numbers. From my point of view, based on my research, these figures are exaggerated. I know that my data is still incomplete to date, but I only found 222 soldiers in the 36th Division from 14 different Indian nations. Even completing all the information, I notice that it will be difficult to reach the figures announced everywhere.